Staff/Faculty parking areas are reserved until 5 p.m.
Failure to follow the above stated campus traffic safety regulations will result in a traffic violation notice. Heritage University reserves the right to fine or impound any vehicle improperly parked on university property at the owner/operator’s expense. 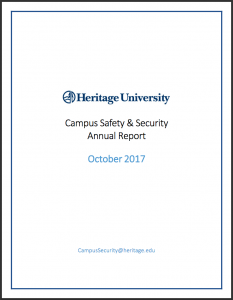 For more information, contact Heritage University Campus Security at (509) 865-8555.